Our custom designed fishing rods are more than just tools... they are extensions of you and your angling style! Captain Derwood Roberts has always had a passion for fishing and a desire to fish with the best tackle available. Throughout the years he has fished with just about every model of fishing rod that every manufacturer had made and nothing quite suited every unique situation perfectly. His solution was to build his own custom rods that would be able to match every type of fishing situation perfectly. It didn't take long before he was taking requests to build custom fishing rods for other people and from there, Adventurous Custom Rods took off. Recently, Derwood and Capt. Jim Ross teamed up to design a production line of rods called Memory Stix. These rods offer the custom quality and feel Adventurous Custom Rods has become known for but offer an "off the shelf" availability. Our Memory Stix are our production line of rods. We designed this line of rods from the ground up and use only the best components. Years of research and experimentation went into designing these rods so that you can have a high-performance rod with a custom feel. Enhance your fishing edge with a custom fishing rod from Adventurous Custom Rods. 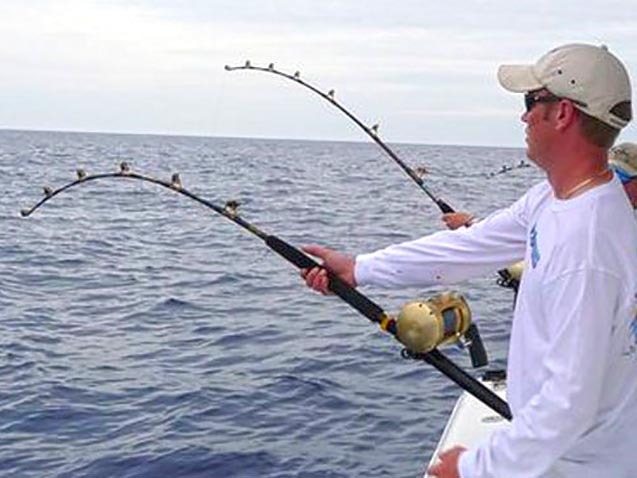 Whether you prefer line-screaming, deep sea action, trolling coastal waters, or fishing the backwaters, Adventurous Custom Rods can craft the perfect rod for you. Enhance your fishing edge with a custom rod from Adventurous Custom Rods. Whether you prefer line-screaming, deep sea action, trolling coastal waters, or fishing the backwaters, Adventurous Custom Rods can craft the perfect rod for you. Express your style and personality. What is the name of your boat, favorite sport, or alma mater? From the exterior color scheme to the fishing capability, each rod is handcrafted to reflect your custom design. At Adventurous Custom Rods, we pride ourselves on the quality and custom design capabilities of our rods. We take pride in the fact that you are just as proud of your rods as we are!